This guitar book is designed as a complete guide to mastering the key skills essential to becoming a great guitarist. It covers all aspects of technique including strumming, fingerstyle, classical, plectrum technique, thumb position and biomechanics. 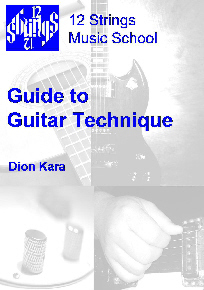 If you are have a basic knowledge of playing guitar who would like to sharpen up your technique, or you are a beginner looking to get everything perfect first time round, then this is the book for you! Available as a PDF file sent straight to you via email or on CD, or as a hardcopy book (postage charges will apply) - just let us know which format you prefer.